I am trying to finish up all the of “little things” cluttering up my studio before I head out for Dallas next week. I love pinsuchions. 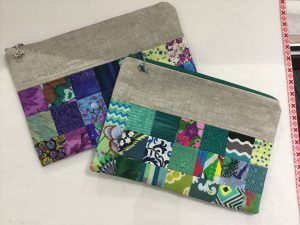 Most of these are made with linen and scraps. I am taking three of them to Dallas for door prizes with the Dallas Modern Quilt Guild group. 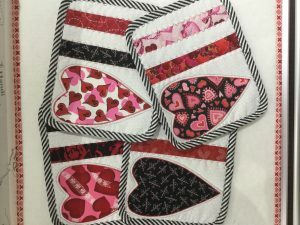 Valentine mug rugs. Prompted by Mother who wanted to make some so I cut out two sets. And a couple of zipper bags. Patchwork scraps and linen. My list of UFO’s is shrinking! Next up – card making which I do in large batches. I will post over the next couple of weeks as I work on these in case you would like to see the process. 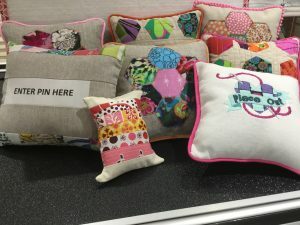 Hands down my favorite thing to do – maybe because it involves a little bit of everything to do with fabric plus words! It doesn’t get any better. Love your work, Susie!! And it looks like you get fulfilling enjoyment out of creating it! !